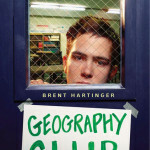 This is a post about Geography Club, Geography Club (the movie) and The Thing I Didn’t Know I Didn’t Know. Hey. I didn’t say anything because I have issues with public speaking so I like to put words together first so I know that I have words and I’m not just standing around looking like I’m trying to say something or make a point when I’m just trying to think because communication words don’t come easily to me. 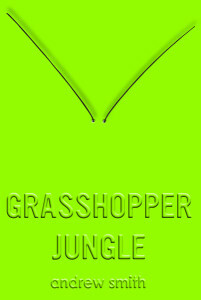 Grasshopper Jungle is a new book by Andrew Smith. I have previously read books by Andrew Smith such as Winger, Stick, and The Path of Falling Objects. I’ve been looking forward to this book for several months. Feels like nearly a year. A year of John Corey Whaley hyping the book to me. A year of trying to get my hands on the galley. An exaggerated year of trying to figure out what the book is about. And the book comes out on Tuesday. So soon you will be able to find out. I finished a free advanced reader’s copy I got from Netgalley so there may have been some changes in the finished copy then what I read. Things that the book reminded me of: mid-century science fiction films, Lost, Venture Bros, plus a fairly honest look at teenage boys in the middle of nowhere Iowa. Sad news folks. Author Ned Vizzini has killed himself. I don’t know the details and most of the information I gleamed through twitter. Author David YenokiPosted on December 20, 2013 Categories booksTags Ned VizziniLeave a comment on Ned Vizzini. First I want you to know that Orson Scott Card is a crazy man and I don’t know if he’s in on the joke or if he’s become the joke. He’s Westboro Baptist Crazy. This is an embargoed review that should not be released before October 1, 2013. I read a digital galley of Justice League Volume 3 “Throne of Atlantis.” It’s probably the best / only story of Aquaman I’ve ever read. Basically: Aquaman and the Justice League try to prevent a war between Atlantis and the people on land. It’s basically the plot of a Doctor Who episode, but instead of silurians we have (the mer people of Atlantis?). You don’t need to have read Justice League Volume 2 or previous issues of Aquaman. Overall I felt it was enjoyable, not very deep or probing. Kind of like a summer super hero movie. Recommended for fans of Aquaman, and the Justice League. Perhaps you are familiar with the Green Lantern and the Green Lantern Corps. Perhaps you know about the Guardians and the power rings. If not, then this is a super hero graphic novel review that is probably not for your eyes. I finished a book today! In the Path of Falling Objects by Andrew Smith. Since there are apparently a billion Andrew Smith’s out there, it’s the Andrew Smith who wrote the best rugby book of 2013 Winger and the I’m not comfortable talking about it without at least a drink in me Stick. There are three brothers. Matthew is a soldier in Vietnam. Jonah and Simon are his younger brothers and they live in the middle of nowhere, New Mexico. Their mother abandons them and their father is incarcerated in Arizona. Jonah and Simon depart on a journey hoping to meet up with Matthew in Arizona. The journey is the story.